Pizza is delicious, amazing, and wonderful, however, today I’m going to walk you through how to take regular pizza ingredients and turn them into a pan of stuffed biscuits with pizza goodness inside. With a similarity to pull-apart bread or cinnamon rolls, we’re heading into amazing pizza territory. Ready? Ok, let’s dive right in. You’ll want to start by taking your pizza dough and letting it sit until it’s room temperature. Depending on how cold your dough is, you may need to let it sit for around 30 minutes. I used a standard roll of Pillsbury pizza dough, but you can choose whichever kind you like to work with. One thing about pizza dough is that it’s really hard to roll out if it’s cold. Carefully roll the sides of the dough up into a neat little package and pinch it at the top so that it seals. From here, you can place them into your pan, pinched side down. If some of your rolls break or pinch off, revealing some of the filling, don’t worry, because that’s exactly what happened to me. Depending on how thinly your dough is rolled, some of your dough might tear or break. Imperfection is inevitable, but spoiler alert: they were still delicious. 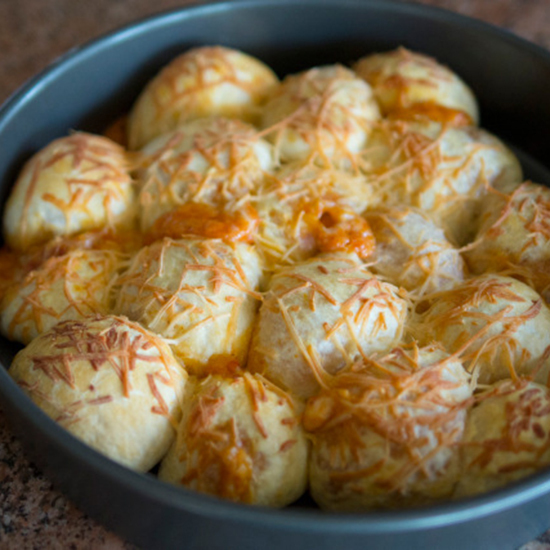 Right before you pop them into the oven, brush the tops of the rolls with generous amounts of melted butter and shredded parmesan cheese. Bring your refrigerated dough to room temperature. Preheat your oven to 375 degrees, and grease an 8-inch pan and set aside. Lightly flour the surface you will be rolling your dough on. Separate your dough into about 2 tbsp pieces until it’s completely separated, about 15-17 pieces. Roll out each piece into a diameter of 3-4 inches. Add sauce, a pinch of cheese, and a slice of pepperoni to each rolled out piece of dough. Carefully pinch up the sides of the dough and seal the top to form a roll. Place each roll into the grease pan seal-side down. Continue this process until the pan is full or until you run out of rolls. Brush melted butter over the rolls and top with shredded parmesan cheese. Bake for 25-30 minutes or until golden brown. Let cool for 5-10 minutes and serve with leftover sauce.